Yvette Hovsepian Bearce '93 (Business) has come a long way from being a refugee to living the American Dream. Now she helps other refugees in need of a future. Photo by Lee Choo. When an Armenian family fled their home country of Iran in August 1984 to escape the Iran-Iraq war — as well as the political and religious oppression of the time — they did not know what the future held for their three young daughters. Hopeful to start a new life in the West, the family arrived in a refugee camp in Karlsruhe, a city in southwest Germany, in August of that year. But when the taxi dropped them off in front of the camp, their hopes vanished in the face of the prison-like military gates that fenced in hundreds of refugees living in the camp. The family’s second oldest daughter, Yvette Hovsepian Bearce ’93 (Business) still remembers her life in that refugee camp in Germany — the hopelessness, anxiety and fear of the future. Little did she know she soon would be living the American dream — graduating from California State University, Northridge with a bachelor’s degree in business, earning a master’s degree in theology from Fuller Theological Seminary in Pasadena and then a Ph.D. in Islamic studies from UCLA. Hovsepian Bearce, still traumatized by the events of fleeing her home country, leaving behind relatives, friends and her father, transformed from a shy and quiet girl into a strong-minded leader. Equipped with only one Farsi-German dictionary, Hovsepian Bearce and her younger sister immediately studied the German language and culture, becoming proficient in just four months. “I knew if I wanted to find my place in this society and not become a victim of a refugee camp, I had to learn the language and the culture and accept my new life — and the new reality for me,” she said. After eight months, Hovsepian Bearce’s father joined the family in Germany, 10 months later, in January 1986, the family moved to California after their asylum request was granted. It was a painful experience for Hovsepian Bearce, who had just come to accept Germany as her new home, she said. Hovsepian Bearce and her family arrived in Glendale on a Monday in January 1986, and a week later, she had started English as a Second Language (ESL) classes at Glendale High School. Still mourning the departure from Germany, Hovsepian Bearce started her journey through American college life and found herself in a major identity crisis. It took Hovsepian Bearce nearly 10 years to fully identify herself as an American, she said. After graduating from Glendale Community College with an associate’s degree in arts, she transferred to CSUN in September 1989. Attending CSUN was one of the fundamental steps to finding herself in her new country, she said. Hovsepian Bearce said she has fond memories of her time at CSUN and particularly remembered James Bennett, a business administration professor at the time, who initially failed Hovsepian Bearce for a major assignment in a business writing class. Discouraged by the failing grade, Hovsepian Bearce made an appointment with the stringent professor. 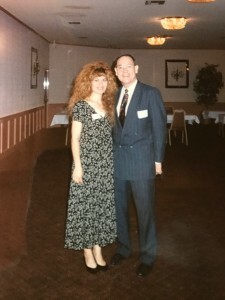 Yvette Hovsepian Bearce and her mentor, former CSUN professor James Bennett at Hovsepian Bearce’s scholarship award ceremony in 1993. Photo Courtesy of Yvette Hovsepian Bearce. She recalled Bennett explaining that he wanted her to write like a businesswoman, and the only way to reach this goal was to point out mistakes from which she could learn. Bennett challenged her the most during her time at CSUN, Hovsepian Bearce said, but he also helped her to grow professionally and personally. After graduating from CSUN, Hovsepian Bearce scored a job at a local firm, but as an expert linguist, speaking Armenian, Farsi, Dari, Tajiki, German and Arabic — a unique and notable combination — she soon found work serving as an interpreter for state, federal and immigration courts. After the 9/11 attacks, she joined the FBI’s counterintelligence and counterterrorism unit as language consultant and analyst. 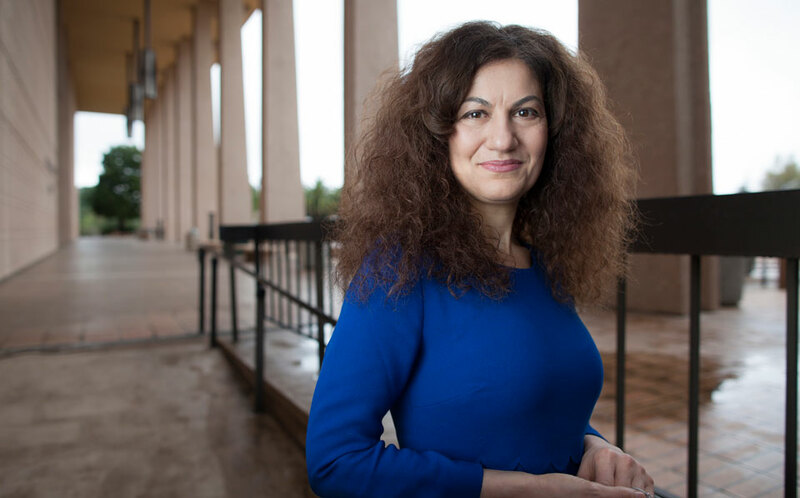 Interested in diplomacy and with a passion for finding peaceful solutions to the conflicts in the Middle East, Hovsepian Bearce said she decided to do a comparative study of the three dominant religions in the Middle East – Islam, Judaism and Christianity – and obtained a master’s degree in theology from Fuller Theological Seminary in Pasadena (in 2007). With a focus on U.S.-Iran relations, she pursued her Ph.D. in Islamic studies from 2008-12 at UCLA, where she wrote her dissertation analyzing the political worldview of Iran’s supreme leader, Ayatollah Khamenei. With Washington, D.C., in mind as her audience, Hovsepian Bearce wrote her 457-page dissertation, including 1,200 references, in nine months. She primarily focused on Farsi sources published in Iran. On the day she defended her dissertation, committee member Steven Spiegel, head of the Center for Middle East Development at UCLA, proposed his plan to turn the dissertation into a book. In short order, the book was published. Since its release in August 2015, The Political Ideology of Ayatollah Khamenei has gained national and international recognition. Former President Barack Obama and former presidential candidate Hillary Clinton received copies of the book, and both sent Hovsepian Bearce personal thank-you notes, she said. Hovsepian Bearce also sent copies to a dozen U.S. policymakers in California and Washington D.C., as well as to former U.S. Secretary of State John Kerry, Israeli Prime Minister Benjamin Netanyahu, Saudi Arabian Foreign Minister Adel al-Jubeir and Iranian United Nations Ambassador Gholamali Khoshroo. Hovsepian Bearce also hand-delivered a copy to German Chancellor Angela Merkel. Hovsepian Bearce has been involved with the Syrian refugee crisis since 2015, volunteering in refugee camps throughout Germany and developing integration programs with nonprofit organizations and camp directors. She also travels across the U.S., giving presentations on the issue to raise awareness. According to the United Nations Refugee Agency, 21.3 million refugees are currently displaced worldwide — about half of them are under the age of 18. Hovsepian Bearce said she wants to bring awareness to the dire situation and help refugee families, individuals and children seeking a future.